Lisa Williams shares what 10 years of Alabama Launchpad means to her. For Alabama Launchpad’s 10-year anniversary celebration, the Launchpad team asked supporters, competition winners, former judges and others to choose words that best describe what 10 years of Launchpad mean to them. We had words such as connecting, growth, ideas and moving forward. 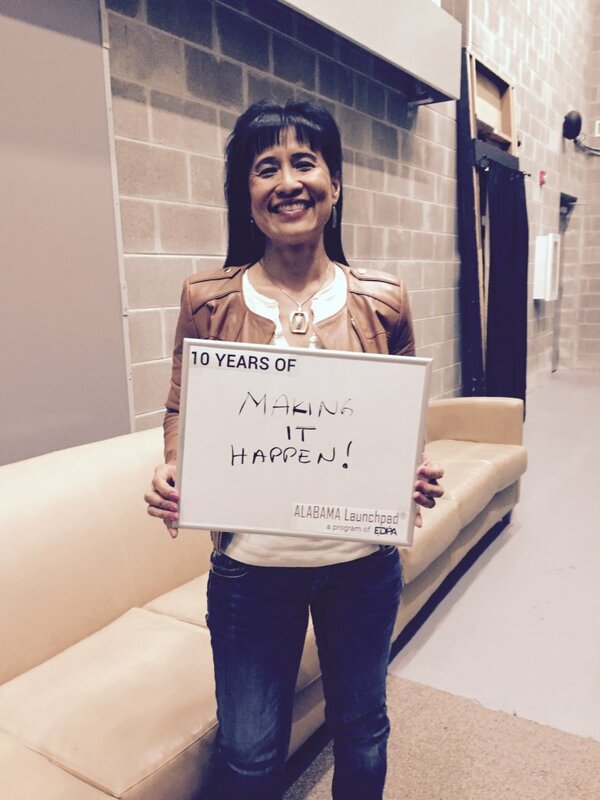 One of our latest contributions to the 10-year anniversary fun is “Making It Happen” from Lisa Williams, president of Chimaera, Inc., and a recent Launchpad judge. For many entrepreneurs, Alabama Launchpad, a program of the Economic Development Partnership of Alabama, is making it happen and helping to make their products, services and ideas a reality with a needed boost of funding for their early-stage companies. Instead, the startup, which won $15,000 in funding in our most recent April 7 Startup Competition Finale in Florence, received the support of Calhoun County commissioners on June 23 as it seeks approval from the Alabama Department of Environmental Management in the process to build an 86-acre composting facility on Alabama 77 in Lincoln. Styers, whose company won $25,000 in August 2015, has credited the Launchpad competition for pushing the company – which connects scientists from around the world with freelance editors to publish their research in English language journals- out of the starting gate, allowing the company to turn a great idea into a real business. Testimonials line EditBIOMED’s website, offering positive feedback of the startup’s services. It’s not just startups that Alabama Launchpad is helping to make it happen. Peggy Sutton, founder and president of To Your Health Sprouted Flour Co., credits attention and exposure from winning a 2015 Alabama Innovation Award through Alabama Launchpad and EDPA to help in the efforts to improve water services for the Bullock County company as it expands and employs additional workers. Started in Peggy’s kitchen in 2005, the company is considered the world’s leader in sprouted organic flour. These are just among the many examples of how Alabama Launchpad is “Making It Happen.” The list goes on. Thank you, Lisa for noticing. Have a word to share that describes what 10 years of Alabama Launchpad mean to you? Email it to Mary Hope Garmon at mgarmon@edpa.org.